Caca. Poop. Number two. Kids have a thousand names for it. Don’t they want to know where it comes from? The Fantastic Voyage of Señor Caca shows kids the hows and whys. 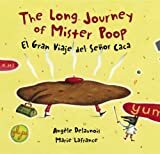 Check out this book about....you guessed it....poop! It has a hilarious title. I might just buy it myself!